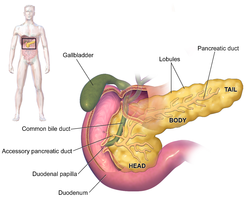 The pancreas is a glandular organ in the digeestive seestem an endocrine seestem o vertebrates. In humans, it is locatit in the abdominal cavity behind the stomach. 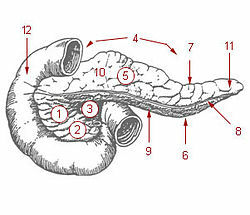 It is an endocrine gland producin several important hormones, includin insulin, glucagon, somatostatin, an pancreatic polypeptide which circulate in the bluid. This page wis last eeditit on 2 Mey 2017, at 04:42.